We are pleased to announce KYOTARO’s exhibition, “I SAW A LOT OF FAIRIES 2004-2010.” This is her first solo exhibition in two years at Mizuma Action. KYOTARO is well known for her wide range of activity such as drawing artworks for magazines, illustration, advertisement, animation and comic. For the last exhibition, she drew “gods” that have absolute presence in the quiet and dignified world all drawn by pencil. On the other hand, this time, it is narrative of fairies, which she has been drawing since 2004. This exhibition is composed around her series “I SAW A LOT OF FAIRIES 2004-2010” on which she used colors. KYOTARO expressively drew birth and rebirth of fairies, and their behavior. In their dynamic countenance, we see joy, sorrow and wistfulness. As viewers, we even confuse as if we are actually in the land of fairies. 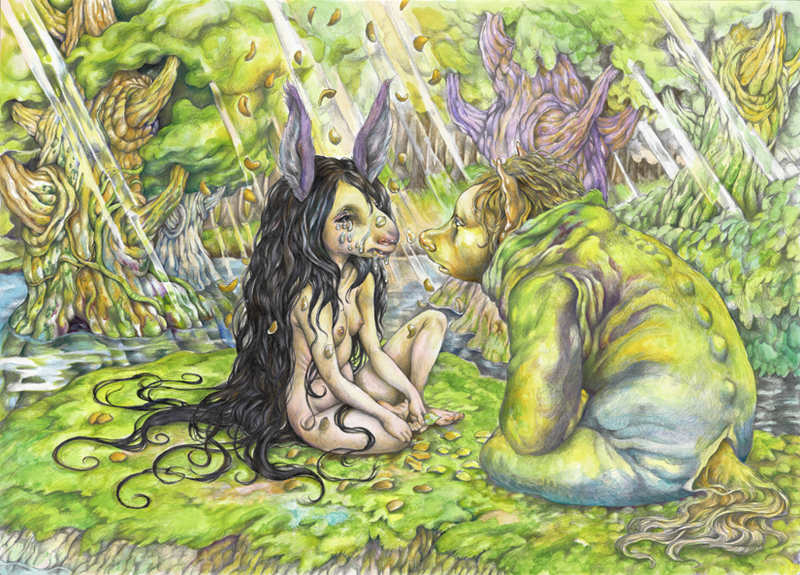 Fairies are portrayed colorfully with soft and sensitive mediums such as colored pencils, watercolor and acrylic. We believe that the viewers can experience her passion in her meek lines and watery colored works. We are going to exhibit the residences of heavenly world, “Silurian god ” *1 and “seven princesses of Pleiades “*2 painted on large canvases as if they are looking at them. KYOTARO chooses something invisible for her subject as gods in 2008, and fairies this time. She says “the world of gods and fairies are totally different, however, they exist on the same spot at the same time. I believe that there is various dimensions mixed and exist on this earth. I feel like this world is not only of humans. I had to complete this artwork so I won’t forget and I want remind many people that the fact this earth is truly a huge mass, and everything is connected. My wish is to be able to recognize ourselves who are pressing on toward future every minute. Last time, gods were there boldly. On the other hand, this time, fairies expressively lead a life. This series of 24 panels of sequential cropping were made up that the last one gets back to the first one. However, they are not going back to the same place, because as story progresses, the time passes over. It is like going over a spiral. The fairies evolve to new dimension that beyond their flesh, and are to be cleansed, and connecting to heavenly world. The story lies ahead is yours to weave. *2.Princesses of Pleiades: the Pleiades star cluster is an open star cluster of Taurus. KYOTARO felt femininity to these stars, and painted as princesses.